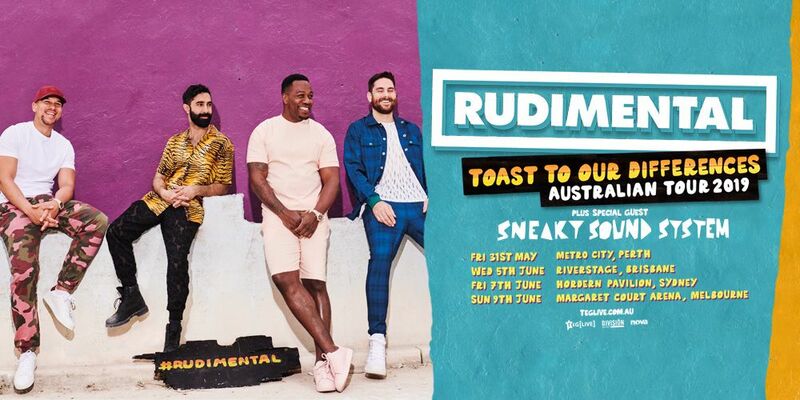 East London luminaries, Rudimental are heading back to Australia for a national tour this June, as part of their Toast To Our Differences World Tour to celebrate the release of their new album that’s set to drop globally on Jan 25, 2019. With over 1.4 billion global streams, 20 million single sales, 40 platinum awards, 22 million monthly listeners on Spotify (ranked 55th artist in the world), 700 million YouTube views and a global audience of over 1.5 million across socials, there is no doubt Rudimental are conquering the world and loving every second of it! There’s a lot of love for these guys here in Australia, and they’re pumped to get back to our shores!